The story behind the Hindi horror flop Hisss is as much about the film that wasn’t made as the film that was. Documentarian Penny Vozniak recorded director Jennifer Lynch during the making of Hisss, resulting in Despite the Gods: an engrossing feature about a filmmaker pushed out of her own movie. Lynch spent eight months filming Hisss in India, her first time working in the country. When we first see her settling in to her Chennai apartment, she observes that India is loud. Lulls in the concussive sounds of construction work outside her apartment are filled by chatter from the noisy street below. It makes concentration and relaxation difficult, to say the least. Lynch is accompanied on her trip by her 12-year-old daughter, Sydney, who is the real star of Despite the Gods. Sydney is wise beyond her years, encouraging her mother to stop fretting about her weight and focus on her movie. The fact that Sydney endures this odyssey with a minimum of whining is a testament to her maturity. Hisss is beset by a number of problems: rain, a jumbled schedule, a union strike that forces the production to move to Kerala. The funny, foul-mouthed Lynch stays positive throughout, insisting that adverse circumstances often result in a better finished product. Little does Lynch know that she’s being sabotaged from within. The producer who brought her onto the project, Govind Menon, repeatedly tries to take control of the film away from Lynch, under the pretense of serving the greater good. Touting his past directorial experience and familiarity with the way things are done in India, Menon offers to shoot portions of the film himself in order to speed things up. Lynch doesn’t bend, insisting on doing things her way. Having watched Hisss, Menon clearly overestimated his ability as a storyteller. The movie is awful, although the footage Lynch shot actually looks quite good. There were some incredibly painful moments that were kept in Penny’s cut and other things that didn’t end up in it because producers wouldn’t allow them to be shown. Sometimes I see myself upset onscreen and think, “I was sad because this happened, but nobody will ever get a chance to see it.” And yet, this is Penny’s film, not mine. She made the film that she wanted to make to the best of her ability, and I’m honored to have been seen through her eyes. Besides Menon, the rest of the Indian crew is devoted and professional. The second assistant director, Yogi Dixit, is particularly charming. The caterer, Krishna, fills in as a sound effects artist and on-set masseur. Hisss star Mallika Sherawat is smart and self-aware. She’s cognizant of the boldness of her career choices in conservative India, and she and Lynch spend much of their downtime discussing social issues. There’s no guarantee that Lynch’s version of Hisss would have been a success. It’s hard to imagine the scene of Sherawat making out with a snake puppet looking anything other than silly, no matter who edited it. Still, Despite the Gods highlights that Lynch was using her film to make a point about female sexuality, and that aspect was eliminated from the version ultimately released. Maybe someday we’ll get a director’s cut of Hisss. I’m very curious to see it. 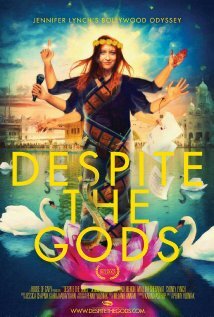 This entry was posted in Reviews and tagged 2012, Bollywood, Despite the Gods, Documentary, Govind Menon, Hindi, Hisss, Indian, Jennifer Lynch, Mallika Sherawat, Movie Review, Penny Vozniak, Sydney Lynch, Yogi Dixit on December 11, 2015 by Kathy.